Nowadays, people are entirely dependent upon their mobile devices to interact with businesses. To run a business successfully, a businessperson should have a substantial online presence along with providing a great mobile experience for the customers. Due to the presence of many devices, it is essential to create an application with a single app development platform. Sencha Touch develops apps that work on every platform without changing any application compatibility. 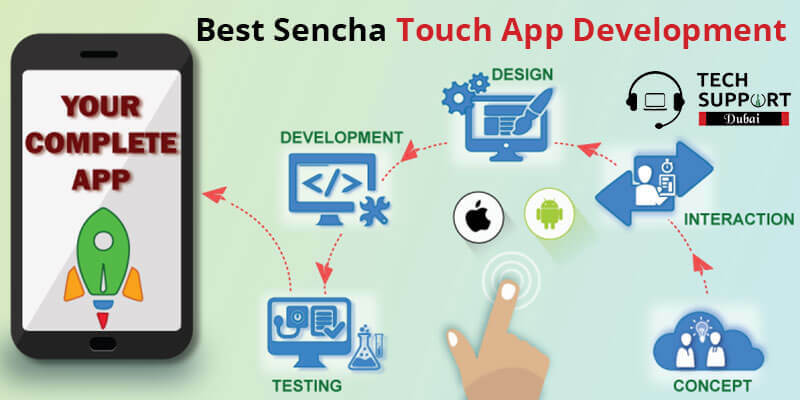 So, if you are searching for any reliable source for Sencha Touch App Development in Dubai, then you may connect to our service providers at Tech Support Dubai. Our team consists of experts who are working in this app development industry for many years and have all the necessary ideas and tools to develop you a perfect Sencha Touch App. You should know what type of application suits your business. Mentioned below are some of the major benefits that you can get by using Sencha Application. It has a great responsive touch feature: Everyone wants easy navigation with mobile applications. The Sencha touch application code provides an excellent responsiveness for different applications. For customer satisfaction, an application should always have a smooth touch feature. Sencha Touch app has the best touch feature compared to any other programming language. It has the highest compatibility level: Sencha touch app has exceptional compatibility with iOS, Android as well as Blackberry. It provides the best results on all platforms. With its twisted and turned programming, it is the best choice for all platforms. Sencha app provides a guaranteed speedy operation: Hindrances due to slow speed always lowers the customer’s satisfaction level. They always want mobile applications to work very fast. App, you can quickly create a native application that will easily work on different platforms. So, businesses do not have to create different applications for different platforms. Our developed apps work on every device. The apps we develop work very fast and are always efficient to provide you with your desired output. Our developers provide several HTML5 and CSS features while developing an app. The applications are highly scalable and therefore, they are super flexible when used. Our experts customize every interaction that is done on the screen. Our applications are always enhanced with different touch events along with better GUI-based control. The applications we develop are always compatible with iOS, Android as well as Blackberry along with several other platforms. Our service providers always deliver your product within a limited amount of time. Our service charges are always affordable that will suit your budget. You can directly call us on Tech Support Dubai helpline number: 042053349 for affordable services for Sencha Touch App Development in Dubai. We also have a live chat portal where you can chat with our tech experts regarding any app development issues. On our chat portals, you can even comment on different ideas to develop a touch app. Moreover, we have an official email ID where you can send us your service request. Our experts will connect with you soon and deliver premium quality services at an affordable price.